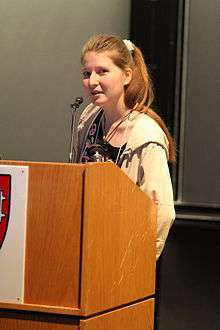 Alexandra Asanovna Elbakyan (Russian: Алекса́ндра Аса́новна Элбакя́н) is a Kazakhstani graduate student, computer programmer and the creator of the site Sci-Hub. The New York Times has compared her to Edward Snowden for leaking information and because she avoids American law by residing in Russia. Ars Technica has compared her to Aaron Swartz. Elbakyan was born in Almaty, Kazakhstan on 6 November, 1988. She is of Armenian, Slavic and Asian descent. Elbakyan undertook university studies in Astana, where she developed skills in computer hacking. A year working in computer security in Moscow gave her the money to proceed to Freiburg in 2010 to work on a brain-computer interface project, and she developed an interest in transhumanism, which led her to a summer internship at Georgia Institute of Technology in the US. She began Sci-Hub on her return to Kazakhstan in 2011, characterised by Science as 'an awe-inspiring act of altruism or a massive criminal enterprise, depending on whom you ask'. Following a lawsuit brought in the US by the publisher Elsevier, Elbakyan is presently in hiding due to the risk of extradition. According to a 2016 interview, her neuroscience research is on hold, but she has enrolled in a history of science master’s program at a “small private university” in an undisclosed location. Her thesis focuses on scientific communication. ↑ Rosenwald, Michael S. (30 March 2016). "This student put 50 million stolen research articles online. And they're free.". Washington Post. ↑ Murphy, Kate (2016-03-12). "Should All Research Papers Be Free?". The New York Times. ISSN 0362-4331. Retrieved 2016-03-28. ↑ Kravets, David (3 April 2016). "A spiritual successor to Aaron Swartz is angering publishers all over again". Ars Technica. Condé Nast. Retrieved 18 April 2016. ↑ Bohannon, John (29 April 2016). "Who's downloading pirated papers? Everyone". Science. 352 (6285): 508–512. doi:10.1126/science.aaf5664.